FOODJAMS Vol. 4: TOMATO, ONION, & SWISS RYE TARTS — Mel bakes things. A couple of weeks ago, I took a day off of work pretty much for the sole purpose of going to the farmer's market and spending the day cooking. And also to get myself a doughnut from Doughnut Vault (their chestnut glazed doughnut is LEGIT, you guys). I had one last floating holiday to use before the end of the fiscal year, and it wasn't going to roll over. You best believe there's no way I'm wasting a free day off. I had no idea what I wanted to cook...I figured I'd fly by the seat of my pants (ok, but really, why is that a saying??) and just roll with whatever looked tasty and in-season at the farmer's market. There were crates and crates of beautiful tomatoes everywhere, and I just couldn't NOT cook with them. I even found a stand that would let me mix and match all of the tomato varieties for a pretty reasonable price, which was the nicest thing ever at the time because I really just couldn't decide on one or two types. That said, welcome to FoodJams Volume 4! If you're confused about what that means, see volume 1, volume 2, and volume 3. 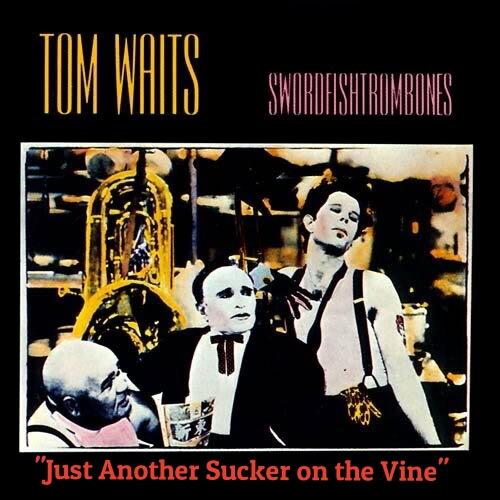 If you're not already a fan of Tom Waits, you should be. He's quirky, and his music is always interesting. As always, click on the album art above to head on over to read Brandon's post at Black Porridge and have a listen to the song. It's an obvious parallel, right? Tomatoes spend their lives on vines until they're ripe and juicy and delicious and it's time for us to devour them. So let's get to that whole devouring part! Preheat oven to 375F. Spray your tart pan(s) with nonstick spray. I used four 4.5" mini tart pans, and still had some of the dough and filling left over. Sautee your onions in a bit of olive oil. Once your onions just begin to soften, add the dried oregano and a bit of salt and pepper, and the shisito peppers (if using). Continue to cook until onions are softened. Set aside. Make the crust: Add the flours, sugar and salt to the bowl of your food processor and pulse until combined. Scatter the butter over the flour mixture, and pulse until you achieve the consistency of coarse sand. Add 1 TB ice water, and process for about 5 seconds, then add another, and process for another 5 seconds. Your dough should form large clumps and have no powdery bits. If it is still too dry, add the third TB of ice water and process again. Press dough into tart pan(s). Alternatively, you can refrigerate the dough for about half an hour, and then roll it out to fit your tart pans. Pressing the dough into the pans (without rolling) involves a lot fewer dishes. Once the dough is in your pan(s), freeze for 20-30 minutes. Remove pans from the freezer. Time to par-bake the crust! Grease a piece of foil, and fit the foil into the tart pan so it lies against your crust and covers the edges. Fill with pie weights (I use dry beans). Bake for 15-20 minutes, or until you just barely start seeing color along the edges and the bottom of the crust no longer looks wet. Remove the foil and pie weights, and bake for another 5 minutes with no cover. Assemble tart(s): Scatter sauteed onions (and peppers, if using) over the bottom of your tart(s) shells. Then, add 2/3 of the shredded cheese. Then, scatter the tomatoes over the cheese (you can be strategic or haphazard about this, just be sure they're fairly evenly distributed). Then carefully pour the beaten egg into each tart. You may not use all of the egg, but you can fill the tart(s) until the egg reaches just below the top edge of the crust. Top with the remaining cheese. Bake at 375F until cheese is golden and egg is set and no longer watery. For my small tarts, this took about 20-25 minutes, but the time will vary based on your oven and the size of your tart(s). Just keep an eye on it. Allow to cool for 15 minutes before serving. Leftovers will survive in an airtight container in the fridge for a day or two. After that, you're dealing with a pretty soggy crust.